“I’m starting to like these wildcard play-offs,” says teenager Madison Keys after winning the Aussie Open wildcard playoff. A week ago, 15-year-old Ashleigh Barty won the Australian Open Wildcard Play-off in Australia, and this past weekend another youngster – 16-year-old Madison Keys – won the American version of the event. Keys, who was the No.6 seed in the eight woman, single elimination draw, was nearly beaten in the quarterfinals, saving a match point down 7-6 in the third set to beat No.3 seed Jamie Hampton, 36 64 97. She then recorded another comeback victory in the semifinals, ousting No.2 seed Alison Riske, 36 64 61. “I prefer not to go three sets if I have the choice, but if I lose the first set then of course I want to go three,” Keys said after toughing out her semifinal victory. “I just try and focus on playing better than I did in the previous set.” History would not repeat itself in Sunday’s final, as Keys won the first set against No.5 seed Gail Brodsky then closed her out in straights, 63 64. “I’m starting to like these wildcard play-offs,” said Keys, who won a similar event in the summer to get a wildcard for the US Open. “I didn’t feel any pressure. I’m one of the younger ones still so I’m not supposed to win these matches. “I knew she was getting pressured by my power. My serve came in handy.” Keys first made headlines two and a half years ago at the clay court event in Ponte Vedra Beach, Florida, when she became the seventh-youngest player ever to win a WTA main draw match (she was 14 years and 48 days old at the time, preceded by 13-year-olds Mary Joe Fernandez, Jennifer Capriati and Steffi Graf and 14-year-olds Martina Hingis, Kathy Rinaldi and Tracy Austin). A few months ago, after winning the aforementioned wildcard into the US Open, she beat WTA veteran Jill Craybas to reach the second round, where she then fell to Lucie Safarova – who ended up finishing the season ranked No.25. Now the Illinois-born Keys will play her second Grand Slam main draw. Madison Keys loses her match, but wins the praise of all Amercans who can now have some hope for Womens tennis after the Williams sisters are gone. Keys showed tremendous composure in regrouping after losing the second set, taking advantage of a poor serving game from Safarova to break for a 2-1 lead. Keys had three game points for a 3-1 lead, but was unable to convert on any of them and lost her serve to level the match at 2-2. With Safarova serving at 3-3, a lengthy four-deuce game ensued that featured some of the best rallies of the match. A strong return of serve from Keys secured the break and a 4-3 lead, but she immediately lost her own serve once again to even things up at 4-4. One game later, Keys served to stay in the match at 4-5. She quickly went down 0-40 and sent a forehand long on Safarova’s second match point to wrap up play after over two hours on court. 16 year-old Madison Keys defeats one of the oldest player in the draw. Madison Keys, a 16-year-old from Boca Raton, Florida, became the youngest player since 2005 to win a U.S. Open match by beating 37-year-old Jill Craybas 6-2, 6-4 on Monday. Keys was making her Grand Slam debut and third tour-level appearance. At 455th, she’s the lowest-ranked woman in the field. Craybas was playing in her 45th consecutive Grand Slam tournament, but is ranked 111th and—like Keys—needed a wild card from the U.S. Tennis Association to get into the main draw. She made her Grand Slam debut at the 1996 U.S. Open, about 18 months after Keys was born, and was the second-oldest entrant this year. Four 16-year-olds, all days or weeks younger than Keys—Vania King, Nicole Vaidisova, Sessil Karatantcheva and Alexa Glatch—won U.S. Open matches in 2006. Keys to face #1 seed Mladenovic in a rematch. French top seed Gianni Mina enjoyed a straightforward 62 61 victory over Slim Hamza of Tunisia to reach the quarterfinals of the Dunlop Orange Bowl, the last Grade A event of the year. World number five Mina had a fine clay season in 2009, winning both the tournaments of Istres and Beaulieu sur Mer and reaching the final round at the Luxemburg Junior Open, Banana Bowl and Roland Garros. In the hope of equalling Guy Forget’s feat of winning the 1982 Orange Bowl, he will now try to claim his first junior trophy outside his homeland. Mina will next meet twelfth seed Junior Ore of the USA, who dropped the first set and battled back in the second before his opponent, sixth seed Guilherme Clezar of Brazil, was forced to retire with cramps in the fifth game of the decisive set, trailing 46 62 31. In the top half of the draw, unseeded Johannes Van Overbeek from Boca Raton, Florida, required three sets to overcome Jack Carpenter of Great Britain after the American wasted two match points in the decisive set, eventually winning 64 26 75. The boys’ competition saw the upset of the day when Eddie Herr champion, seventh seed Denis Kudla of the USA, lost to unseeded Dutch Justin Elevend. As also happened to Brazilian Clezar, Kudla was forced to retire with cramps in the third set while trailing 36 75 20. In the bottom half of the draw, European Championships semifinalist and eighth seed Arthur De Greef of Belgium came from behind to earn victory over Dutchman Jannick Lupescu, 46 63 64. No 15 Sekou Bangoura of the USA gave the American fans a match to remember, surviving a tough encounter against big-hitting George Morgan of Great Britan. Having lost the first set, 18-year-old Bangoura came back to win the following two, but he frittered away two match points on his serve at 5-3 in the third set and had to fight hard in a dramatic tie-break before winning 46 62 76. Yucatan Cup champion, American fifth seed Mitchell Frank dispatched Oliver Golding of Great Britain with a straight sets victory, 75 75, and will play his compatriot Jack Sock, who advanced into the fourth round with an easy victory over fellow-countryman Dennis Novikov, 75 61. In the girls’ competition, world number one 16-year-old Kristina Mladenovic of France showed her impressive form as she dismantled No 14 Valeria Solovieva of Russia 64 61. The Roland Garros champion, who has an excellent forehand, will now meet unseeded Madison Keys of the USA in a rematch of the Banana Bowl semifinal. 15-year-old Keys, who claimed the title at the Coffee Bowl last January, produced the major upset on Day 4 at Crandon Park as she knocked out last week’s Eddie Herr champion Daria Gavrilova of Russia, winning 63 46 63. Third seed Heather Watson of Great Britain continued her run with a three set win over No 13 Saisai Zheng of China, 61 36 63. Sixth seed Ajla Tomljanovic of Croatia also advanced to the quarterfinals but she needed three sets to overcome aggressive Yulia Putintseva of Russia, the winner of the Grade 1 Santa Croce sull’Arno. Casablanca Cup champion Tomljanovic lost the first set but managed to dig herself out of trouble with a powerful ground game and an excellent serve, triumphing 57 60 61. In the bottom half of the girls’ draw, Adriana Perez of Venezuela outplayed Luksika Kumkhum of Thailand 06 64 63 and Gabriela Dabrowski of Canada won against American Ellen Tsay, 61 62. No 8 Nastja Kolar of Slovenia continued her great campaign in Key Biscayne as she beat Lauren Davis of the USA 62 63 and moved into the quarterfinals without losing a set. She will now face wild card Robin Anderson from Matawan, New Jersey, who defeated compatriot Nicole Gibbs for the first time in her career. Young Madison Keys makes an impressive start. On Monday, top-seeded Kristina Mladenovic of France defeated Ilinca Stoica of Romania 6-4, 6-3. Miami’s Gonzales Austen lost to Richard Muzaev of Russia 6-4, 6-2. Bob Van Overbeek (Boca Raton) defeated No. 14 John Morrissey (Ireland) 7-5, 6-2; Dennis Novikov (Boca Raton) defeated Bartosz Sawicki (Poland) 6-4, 2-6, 6-2. Third-seeded Heather Watson (Great Britain) defeated WC Krista Hardebeck (Santa Ana, Calif.) 6-2, 6-2; Noel Scott (Chicago) defeated No. 7 Camila Silva (Chile) 6-0, 6-4; and WC Lauren Davis (Gates Mills, Ohio) defeated No. 9 Yana Buchina (Russia) 3-6, 7-5, 6-0. The word began to spread in the sun-baked bleachers beside Court 2 at the Crandon Park Tennis Center on Monday, and by the time 14 year old Boca Raton phenom Madison Keys had won her opening match at the Dunlop Orange Bowl International tennis championship, those in attendance had a hunch they had just seen a preview of a rising star. Keys is 5-10 and her serve has been clocked at 114 mph, so she didn’t look at all out of place playing in the 18-under division against Zsofia Susanyi of Hungary, the world’s 11th-ranked junior. In fact, the way Keys rolled through the first set, it was hard to tell which teenager was younger. Perhaps most impressive was Keys’ fighting spirit. After trailing 0-3 in the second set, allowing Susanyi to get back into the match, Keys clamped down and won six consecutive games to take the match 6-2, 6-3. “If I go down like that, it usually means I’m thinking too much about the score, getting all worked up, so I just told myself to relax and stop thinking about the score, and things turned around,” Keys said. But in tennis terms, she is special. Last April, she won her professional debut, beating No. 81 Alla Kudrayavtseva, becoming one of the youngest players to win a pro match since Mary Joe Fernandez and Jennifer Capriati in the 1980s. Because of her age, she is limited to seven pro events a year. She is hoping for a wild card at the Sony Ericsson Open in Key Biscayne in March. Top junior players in the world in 18-under and 16-under divisions play Dec. 6-13. at Crandon Park Tennis Center, Key Biscayne. (early-round 16s matches at Biltmore Tennis Center). Players to Watch — boys: Daniel Berta (Sweden) is ranked No. 1 and won the boys’ singles title at the French Open. Gianni Mina (France) lost to Berta in the French Open final and reached the boys’ semifinals at the U.S. Open. Top Americans include Dennis Kudla of Arlington, Va., and Raymond Sarmiento of Fontana, Calif. Kudla won the 16s title last year and is ranked No. 22 in the world. Gonzales Austin of Miami, the USTA 16s national champion, got a wild card into 18s main draw. Dennis Novikov and Johannes Robert Van Overbeek of Boca Raton are also entered. Girls: Top-ranked Kristina Mladenovic (France) won the girls’ French Open title and was a finalist in girls’ singles at Wimbledon. Heather Watson (England) won the girls’ title at the U.S. Open and is No. 3 in the world. The top American girls are No. 29 Beatrice Capra of Ellicott City, Md., who won a professional title in October; No. 42 Ester Goldfeld of Brooklyn, N.Y., and 14-year-old Madison Keys of Boca Raton, who won her WTA Tour debut in April and reached the 16s final at last year’s Orange Bowl. Will the USTA give Madison a wild card to the US Open? Tennis is a sport in which prodigies periodically emerge like butterflies from a cocoon. Sometimes as young as 5 or 6, and not much bigger than the rackets they wield, destiny’s children swat fuzzy balls around and perform as if they were genetically engineered to win Wimbledon or the U.S. Open. Once identified as prodigies, the select few often are sent away to tennis-intensive learning academies where academic studies are interspersed with hours of on-court instruction. Such sequestering is essential because, as has been demonstrated by the success arc of other youthful wonders, great talent needs to be nurtured ever so carefully, and from an early age. By any definition, 14-year-old Madison Keys, the newest and youngest member of the Freedoms, is a prodigy. The fledgling professional is 5-10 and possesses a serve that has been clocked at 114 mph, which already puts her in the upper tier of power players on the women’s tour. Imagine what she might become once she grows into her still-developing body. John Evert has. “I’m not one of those coaches who will boast about every young protégé that comes along,” said Evert, whose renowned sister, Chris Evert, was the winner of 18 women’s Grand Slam singles titles and unanimously voted into the International Tennis Hall of Fame in 1995. “If 10 come along and one makes it big, then you look like a genius. Evert, who has served as Keys’ coach at the Evert Tennis Academy, in Boca Raton, Fla., for 5-plus years, might have been reluctant to heap too much praise on the kid before her age had reached double-digits. But now that Keys is playing for pay in selected tournaments, and is the youngest player ever in World TeamTennis – she is 17 days younger than Maria Sharapova was when she made her WTT debut – Evert is willing to venture an opinion as to just how bright a future awaits his prize pupil. “I identify talent for IMG [the management company that has Keys under contract],” Evert said. “I’ve seen a lot of these young girls coming up the ranks. I managed Mary Joe Fernandez and Jennifer Capriati. I think Capriati was as good or better than anyone at an early age. She had four wins over top 10 players in her first 3 months on the tour. How Keys became involved in tennis makes for an interesting story. It wasn’t so much the sport that attracted her as the flashy outfits being worn by her favorite player, Venus Williams. So it was off to the store for the toddler’s first racket, the beginning of a love affair with the game that has continued to intensify. Little Madison – well, not so little given her growth spurts – first attended a camp at the Evert Tennis Academy when she was 8, at which point another coach told John Evert to check her out. A year and a half later, Keys’ mother, Christine, packed up Madison and her two younger sisters to relocate from their home in Milan, Ill., outside of Chicago, to Boca Raton. Madison’s father, Rick, an attorney as is Christine, visits whenever possible, and is making arrangements for a permanent move that would reunite the entire family. Keys made her Women’s Tennis Association debut in April in Ponte Vedra Beach, Fla., where she upset – at least it was an upset on paper – Alla Kudryavtseva, then the 81st-ranked player in the world, 7-5, 6-4. Keys’ age precludes her from playing a heavy WTA schedule and, besides, Evert frets that too busy a workload would lead to the sort of injuries that prematurely ended the careers of past prodigies Andrea Jaeger and Tracy Austin. But the WTT offers a reasonable alternative to life on the road before Keys is mentally and physically ready. Being on the same team, at least occasionally, with Venus – whom she has never met or spoken to – is a thrill for Keys, who still likes her role model’s distinctive tennis attire. She also might find herself on the other side of the net when Venus’ sister, Serena, comes in with the Washington Kastles on July 13( a match on the outdoor court at the Plaza in King of Prussia that Madison won!). Madison wins big in Philly over Serena. Teenage tennis phenom Madison Keys made a splash when she downed a Williams sister right in Philly’s backyard. The 14-year-old from Boca Raton, Fla. already looks like a pro at 5-foot-10 with a staggering 114 mph serve. A sold out crowd witnessed the tennis marvel fulfill a lifelong dream when she took the court across from Serena Williams at Philadelphia Freedoms Stadium in King of Prussia, Pa. Monday. She was playing for the Freedoms when they took on the Washington Kastles in a World TeamTennis match. No one expected Keys to upset the reigning Wimbledon champion by an ample margin of 5-1 but she did it anyhow. The Freedom ultimately lost the match 19-18, but Keys’ win over Serena was the highlight of the competition. Now will the win over Serena be just a small glimpse into the bright future of Madison Keys or will she like many teenage stars before fade from the spotlight. Madison Keys added her name to the history books Monday, becoming the seventh-youngest player ever to win a Sony Ericsson WTA Tour singles main draw match. 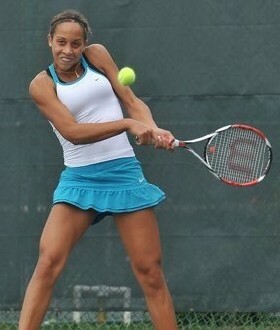 Keys, who played her first professional event on the ITF Women’s Circuit recently in Fort Walton Beach but fell first round, was a wildcard into The MPS Group Championships this week and made excellent use of that, beating world No.81 Alla Kudryavtseva of Russia, 75 64. She rallied from 5-2 down to win the first set and hit four aces in the second set – including one on match point. “The last couple of days were just practice and getting ready for my first round, and after today I have to go back out and do the same thing for my next match,” Keys said. “I don’t really look past my next match. I just take it day by day.” Keys, originally from Chicago, now lives in Boca Raton and trains at the Evert Academy, coached by John Evert. Among her junior accomplishments are Under 12 titles at Eddie Herr and the Orange Bowl in 2007, and she lists clay as her favorite surface. At the Sony Ericsson Open in Miami two years ago, Portugal’s Michelle Larcher de Brito became the seventh-youngest player to win a singles main draw match on the Tour; Keys beat her by just four days.